As Easter approaches, it is time for the Epcot Easter egg hunt known as "Egg-stravaganza." Guests purchase a map for about $6.00 and search for the approximately 1 foot tall eggs, decorated as Disney characters, hidden around World Showcase. There is one egg at each country as well as at The Outpost. 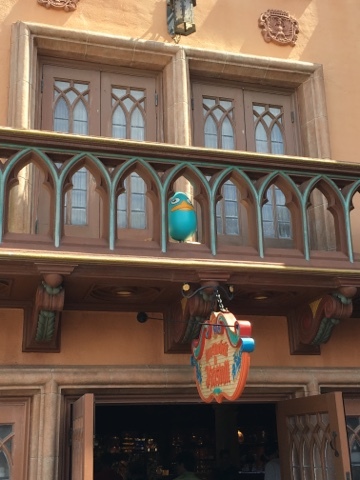 When guests find an egg, they place the corresponding sticker on the map. When the search is complete, they can pick up a prize, which is a small plastic Easter Egg. It is a fun way to pass the time while walking around World Showcase. I took this shot of the "Agent P" egg today, which can be found in Germany.